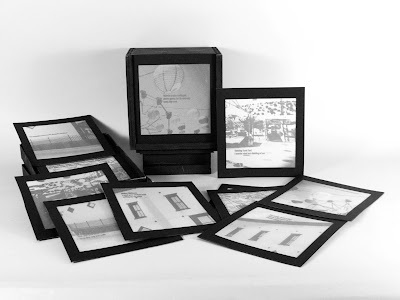 The Common Box Project was a collaborative project initiated by Denver musician and recording artist John Common and Abecedarian Gallery owner and book artist Alicia Bailey. Each invited artist was provided with a wooden box and access to demos and lyrics from John Common and the Blinding Flashes of Light's upcoming album "Beautiful Empty" (September 2009). While reading John Common’s lyrics and listening to his music, I found myself wanting to know more about the people in his neighborhood. Where did they come from? Where were they going? With those questions in mind, I selected excerpts from his lyrics that made me want to know more, lyrics that made me want to find out whose experience was intertwined in his melody. The excerpts were then imbedded in images. Each image is one quadrant of a larger photograph, creating a slide of text and image that doubles as a puzzle piece. Each of the photographs that I chose were images that I had taken of locations that roused a strong sense of place. After creating the lyric slides, I decided that I wanted to answer some of these questions for the viewer of the collaborative box project. I thought about the relationships formed by this project - there is John Common, the musician, Alicia Bailey, the curator-gallerist, me, the creator of the box and you, the viewer of the box. I thought about how this project connected us and how we each have a story to tell. I asked John and Alicia to share four specific thoughts, facts or memories from different points in their lives while I also came up with four from my life. These story pieces were imbedded in one quadrant of a map. When put together, these slides reveal the home state of each contributor. If you decide to enter into this collaborative project, then you also become part of this puzzle. Buying this box completes the cycle, connects the pieces and entitles you to four slides that represent your story. You become the final piece of the puzzle that connects us. As the owner of the box, send me four details of your life, history or memories. Include where you grew up and I will send your remaining slides. The final slide is a colophon slide which details the purpose and processes of the project. The colophon slide will reveal how we are all connected.